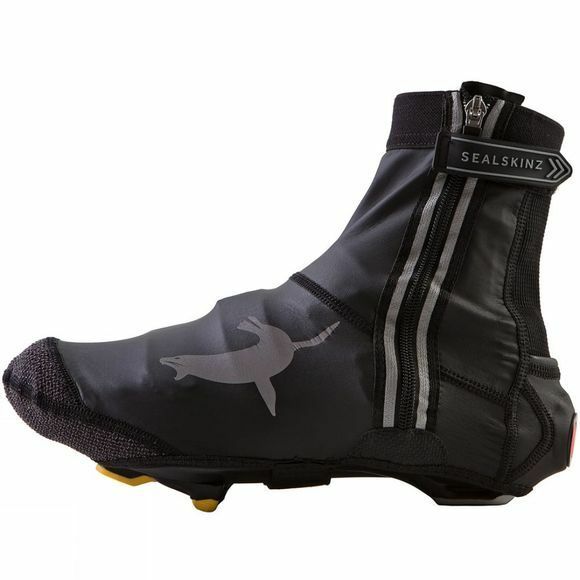 The Sealskinz Lightweight Halo Overshoes emit a bright light visible from over 500 meters ensuring you are seen when out and about in low light. Ideal for road cycling or commuting where you need to be visible. With a simple push on the Halo you can switch between 2 flashing modes or continuous light to adjust the way you are illuminated. Featuring a powerful LED light built into a rear "kangaroo" pouch as to not affect the performance. This means we had to put the entry to the side, which led to an additional benefit of 2 highly reflective pipes for additional side on reflection. All stitching is now ultrasonic heat taped to add additional Water Resistance and performance. A lightweight overshoe is ideal for road cycle and commuting. Storm flap, pull on loop and Hi-vis reflective branding for added safety and protection.